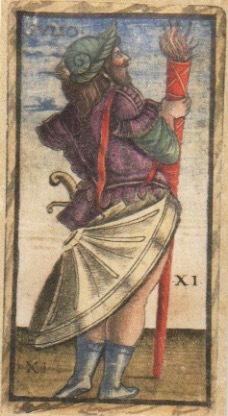 Strength as Major Arcana VIII, however this wasn’t always the case. numbering for his Thoth deck. But changed the names of the cards – Strength became Lust. Contrary ol’ coot! next – ended up with different cards in different orders. It’s easy to imagine courtly gents in tights arguing heatedly about whether Temperance scored more points than Justice in their card game. That’s the sort of argument that can get you run through with a rapier…. Hercules giving the Ebil Nemean lion a jolly good thrashing. Pretty danged violent to our contemporary eyes, isn’t it? A completely different viewpoint from a completely unique deck. 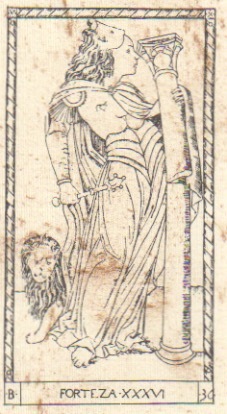 Don’t mix up card VIII which shows a child being dismembered over a fire by Nero – that’s Justice, not Strength! 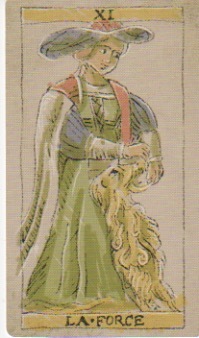 A woman holds a club and wears a lion’s mask. There is also a lion behind her and a broken column. The broken column is traditionally the symbol for Forteza. 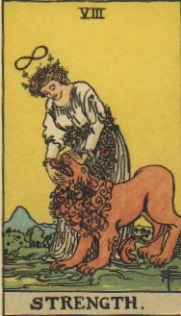 The combination of lion, woman and physicality that we strongly associate with this card makes an appearance. we can see the nascent leminscate of the RWS in the circle of her hat. 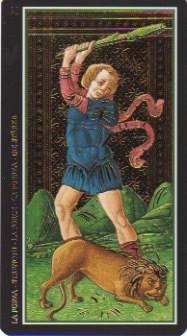 Strength earned her place in the Tarot deck by dint of being one of the four Cardinal Virtues: Fortitude. The other virtues are Prudence (The High Priestess), Temperance and Justice (represented by, erm, Temperance and Justice). The subtle difference is that Fortitude brings a moral strength, a valour (indeed a Virtue!) to the heart of the card, which Strength alone does not. And there endeth the Lesson on Strength! Hope you’re ready to hop onwards to the next card? I usually tell my clients that Strength used to be called Fortitude. It generates a good discussion on the strength of will it takes to make changes in our lives. Well done, Alison! Very enlightening post. Btw, the sola busca version I don't quite get. Thanks for showing the evolution of the cards! I agree with Ania, I'm glad it evolved although the original of Hercules clubbing the Nemean Lion is more of his physical brute strength rather than the gentle flexible strength of the current Strength. I definitely prefer the woman and lion imagery to the poor little lion being clubbed to death, so I'm rather glad it has evolved. Grazie mille for the walk through Strength's provenance – fascinating!